This is the card that was made for the Treat Cup Slider Tutorial on Splitcoast Stampers. 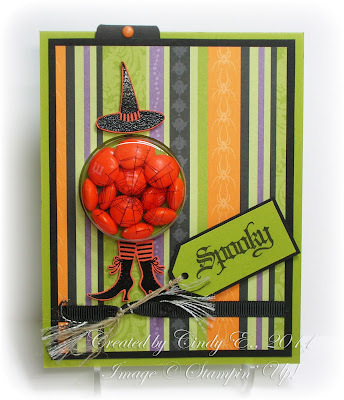 I was so thrilled to be asked by Beate Johns to do the tutorial! (There will be another one for a different technique coming in December, so keep an eye out!) Thank you, Beate. And thanks also to Lydia for doing the video I wasn't able to get done before going to Montana! The spider web from Wicked Cool was stamped in Staz-On on the treat cup and set aside while the hat and shoes were stamped and embossed. They were cut out and mounted with Stampin' Dimensionals at the end. The Basic Black 1/8" Taffeta was used to tie on the linen thread from the tag, and then the ends were frayed. The very edge curls up and looks kinda cool! This technique can be adapted to put the pull-out slider on any side; it doesn't have to be at the top. And it doesn't have to be a card, either! Here is a bunny treat I made for my grandson's preschool class. They pulled the ears to open the slider in back. This is just too cute! Love it.. The tutorial turned out fantastic, Cindy! The photos and instructions are so clear and easy to follow and the card is ADORABLE!! Great job!